There’s one more reason to love Blu-ray now, and that’s for integrating it with your Mac mini, which can tuck quite nicely into your entertainment console. Although performance won’t be as stellar as it with my Early 2011 Core i7 MacBook Pro, the 1.83 GHz Core 2 Duo Mid 2007 Mac mini that is my most recent test subject still gets the job done and does it surprisingly well. It utilizes a 12.7mm internal PATA slot-loading optical drive, but sadly Blu-ray drive upgrades with that many requirements are somewhat scarce (most 12.7mm drives are tray loading, and of the 12.7mm slot loaders, most are SATA and don’t work with pre-2009 Minis). Pre-2009 Mac minis leave you with just a few options for internal optical drive upgrades due to them needing PATA slot-loaders. Fortunately, here’s where the deal gets very sweet for those on the edge considering an upgrade for a pre-2009 Mac mini: This USB 2.0 external Blu-ray drive from eBay seller virtanen13 provides you with a win-win scenario giving you some great options. The UJ-225 is a great option for those with a pre-2009 Mac mini (1.83 GHz Core 2 Duo works but is likely the bare minimum for good Blu-ray disc playback). The drive will provide you with a cost effective way to upgrade the optical drive of your pre-2009 Mac mini to an internal dual-layer Blu-ray writer while also providing an enclosure for your old SuperDrive or Combo drive. Inside the enclosure of this USB 2.0 drive is a Panasonic UJ-225, which is a 12.7mm slot loading dual-layer PATA Blu-ray burning optical drive. 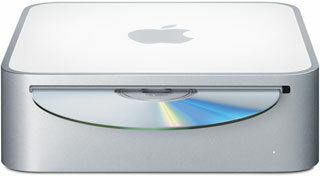 Not only does the external version of the drive make it affordable to own a Blu-ray burning optical drive regardless of which computer you choose to use it with over USB 2.0, it also provides you with the ability to open the enclosure and swap the drive with your 12.7mm PATA SuperDrive or Combo DVD-ROM/CD-RW drive that was supplied with your pre-2009 Mac mini (or any other computer that takes a slot-loading 12.7mm PATA optical drive). The ability to swap out your drive makes this external drive more like a kit, since it can be used to swap out other 12.7mm PATA drives. What more could you want for $89.95? An upgrade and a spare enclosure for your old drive rolled into one for under $100? That’s a great deal! You would have thought that the integrated GMA 950 graphics in pre-2009 Mac minis would hamper Blu-ray playback significantly, and it would have seemed that anything less than the recommended 2.4 GHz Core 2 Duo would have been out of the question, but I watched an entire Blu-ray film on my 1.83 GHz Mid 2007 Mac mini, and the 1080p video is silky smooth and hardly ever stutters on a 22″ 1680 x 1050 AOC LCD monitor over DVI, while the audio is spot-on. The team at Macgo is still hard at work optimizing Mac Blu-ray Player (see our review), now at version 2.5, and it gets better with each version. A reminder: Mac Blu-ray Player does need an Internet connection for a brief period of time to connect to Macgo’s server in order for you to get a small bit of data that is necessary for playback (this data can be read by standalone players normally but not yet on OS X-based Blu-ray players). This data is cached, and after it has loaded (which occurs right after the disc is read), you no longer need a connection (and if you have converted your discs to .mkv files, that extra data is not necessary). Another thing to note is that when using a machine below the 2.4 GHz Core 2 Duo recommended minimum specification, you could experience some playback issues. If Spotlight or any other services or applications are running that might hog system resources, a 1.83 GHz Core 2 Duo with 2 GB of RAM may not be enough, and a hard drive nearly filled to capacity also slows down a system. In short, anything you can do to speed up your system is an obvious plus (aside from a processor upgrade, if that’s even an option) when you are dealing with an application that has recommended minimum specifications higher than your machine does but will still run. Maxing out RAM, cleaning your hard drive of unnecessary data, cleaning up your desktop, and upgrading to an SSD will all boost performance on a low-end system. You may or may not be able to duplicate the success I have had, but the point here is that it’s possible. Blu-ray is still the ultimate storage option for a permanent disc-based solution that you can catalogue and is perfect for photographers and videographers. The only major drawback is the cost of internal drives, but this UJ-225 external (which can become an internal drive if you wish by removing it from the enclosure) is a tempting option. If you haven’t considered an upgrade to Blu-ray yet and own a 2006 or 2007 Mac mini, this is the way to go, and it is essentially a complete upgrade kit! Installation is simple. Just pry off the outer shell of your pre-2009 Mac mini with a thin and narrow 1-2″ wide putty knife/spreader (a butter knife may even do if you are careful), and the optical drive is instantly accessible. Just be careful not to pry too hard, as this could damage the shell. Once you remove the screws that hold the optical drive in place using a #1 Phillips screwdriver and after you pull the drive off the PATA connector, it will be a very easy swap. The enclosure just has two screws. After you take those off, you can open the enclosure by hand (again carefully – the 2-piece shell just snaps apart from the plastic tabs that hold it together – and can be just as easily snapped back together when the old drive is installed). Remove the UJ-225 mechanism from the internal PATA connector/circuit board and can swap it with the optical drive from your Mac mini (or other device that uses a 12.7mm slot-loading PATA optical drive). Reassemble the Mac mini with the UJ-225 inside, reassemble the external enclosure with your old optical drive inside, and you’re ready to start enjoying Blu-ray while having your original optical drive as a spare. Again, please purchase this drive from eBay seller virtanen13 (it is listed as “Laptop USB Blu-Ray Disc Burner Writer Recorder BD Drive”) or at the seller’s personal website. The merchandise is top quality, and I can assure you that the products work great. I am 100% satisfied with the results thus far with the UJ-267 and now the UJ-225. Virtanen13 is a phenomenal resource for optical drives and sells rare and unusual items that aren’t found elsewhere. I highly recommend this drive, and its performance speaks for itself! At the price of this drive and Mac Blu-ray Player, you can add a Blu-ray player to your entertainment center using your Mac mini as your sole media hub device for about the same price as a standalone commercially sold Blu-ray player, but you are also provided with Blu-ray writing capabilities for that price! This product is an incredible value!